As the Olympic Flame lights up London landmarks and we’re all expecting tonight’s Olympic Games London 2012 opening ceremony..
Few days ago, on July 25, Barcelona had celebrated 20th anniversary of the Barcelona 1992 Olympic games that had transformed the city and marked a period of the important urban renewal of Barcelona. 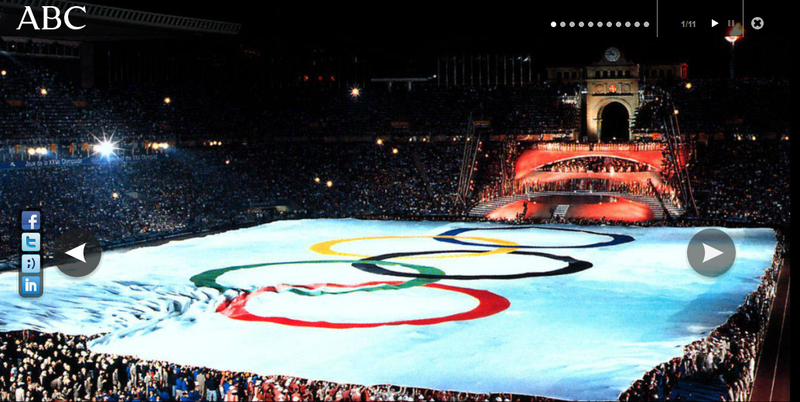 Two decades after that summer afternoon 1992, Barcelona revived Wednesday afternoon the magic of the Olympic Games with a memorial that travels the streets as Olympic torch from the hand of 37 athletes and personalities were part of that unforgettable event. The 1992 Olympic Games had an enormous impact on urban development in Barcelona, transforming it from an industrial city to one than combines industry with art, culture and commerce. This was achieved through the amendment and application of a previously proposed ambitious urban regeneration plan which included improvements to the city’s transport infrastructure, public services and amenities as well as Olympic-related facilities. Barcelona Design Summer is full of surprises..
From 26th June to 5th October..
Sant Joan in Barcelona is one of the greatest nights during the year. It is said that the night of the 23rd of June is the shortest night of the year and the night of fire and witches. 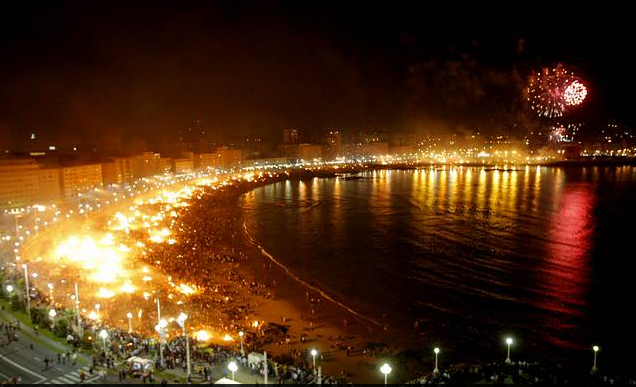 During this festival, les Fogeres de Sant Joan, or the bonfires of Saint John, are lit in cities all around Spain, especially on the beaches of costal areas. The bonfire preparation is done days in advance, and it’s something that people of all ages take part in, and look forward to. 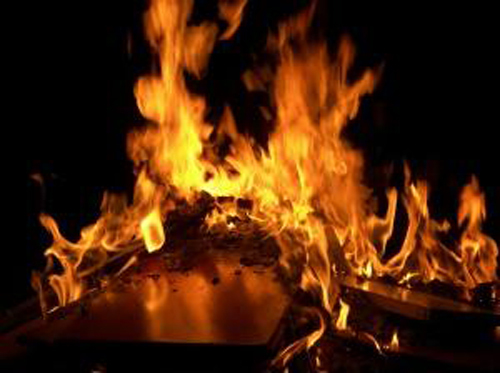 According to the traditions of the festival, anyone who jumps over a bonfire three times during the night of Sant Joan, will be cleansed and purified, and their problems will be burned away. The Sant Joan festivals and fiestas are from sunset on 23/6 to sunrise on 24/6 on the eve of Saint John’s day. The Sant Joan festival is often called “La Nit de Sant Joan” – the night of Saint John. The fiestas are also called “verbenas” or “revetllas,” which means open-air fiestas or celebrations. Midsummer solstice is a tradition from ancient times. The summer solstice was considered the most important event of the solar year in ancient times. 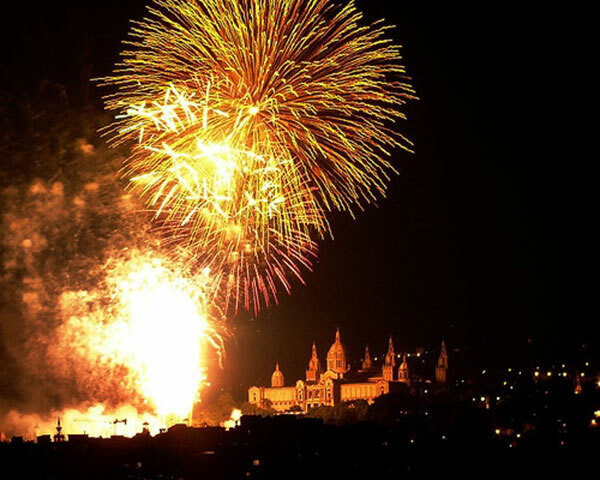 Fire was celebrated on this day as the symbol of abundance, purity and fertility and to this day fire and fireworks are one of the central elements in the Festival of Sant Joan with fireworks and bonfires illluminating the skies of Barcelona. “Qui encén foc per Sant Joan no es crema en tot l’any” means “He who lights the fire for Sant Joan will not burn all year.” The most important element of the festival of Sant Joan is fire. 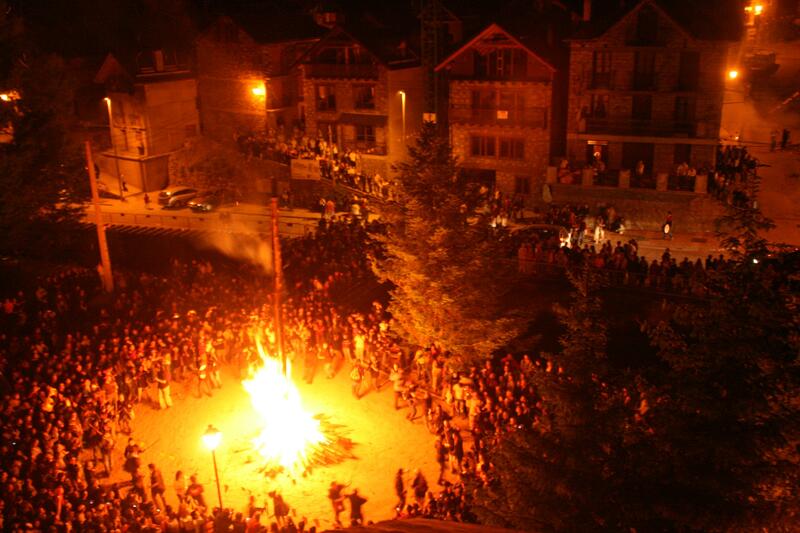 The traditonal flame to light the bonfires is called “La Flama del Canigó” – “the flame of Canigò.” It comes from the peak of a holy mountain called Canigò (2784 m) in the Pyrenees mountains. The tradition of the flame of Canigò was started in 1955 as a symbol of Catalan culture. The original flame is kept alive in the kitchen the museum of Casa Pairal by the Castellet de Perpinyàin. At dawn on 23 June every year a fire is lit using the flame on the peak of Canigò and from there the flame is spread throughout the Catalan regions of France and Spain to light the fires of Sant Joan. In the week before Sant Joan hundreds of volunteers carry the flame from the Pyrenees to city councils, county councils and cultural organizations in more than 350 municipalities in the “Països Catalans” which include the Catalan areas of France. It is estimated around 3000 bonfires, called “hogueras” in Spanish or “fogueres” in Catalan, are lit on 23 June with a flame from the peak of Canigó. 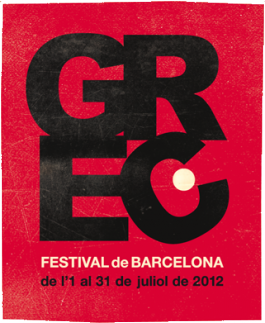 In 2012 La Flama del Canigó will arrive in Barcelona on Saturday 23rd June 2012 at 19:30 on Plaça de Sant Jaume in the gothic area of Barcelona after touring the city streets. From here local torch teams will light their torches and carry the Canigo flame to light Sant Joan fires around Barcelona and nearby towns. The La Flama del Canigó event on Placa de Sant Jaume finishes at 21:00 with fireworks. You can participate in the rituals of fire purification on Sant Joan. If you burn something in the Sant Joan fire it will cleanse your sins and rid you of bad luck. Old furniture is often used for the bonfire to symbolise a gesture of “out with the old – in with the new! Another tradition is that you write down whatever you wish for, throw the note on the fire and then leap into the air three times. The most foolhardy tradition is to clasp the hand of your loved one, and leap together over a bonfire no less than seven times. Then according to tradition you will live happily ever after. The fire jumping sounds like a tradition that is best avoided. Many drunken revellers have been badly burnt when they tried to jump over big fires and have fallen back into the flames. “Bany de Sant Joan, salut per tot l’any” which means “Bathe on Sant Joan and you’ll be healthy all year round” Water is an important element of Sant Joan. According to tradition, on the eve of Sant Joan, you can cleanse your sins in water which symbolises the baptisms of Sant John. According to legend, a swim will cure all your ails, aches and pains. Any water will do. You can swim in the sea, or in a lake, or even just bathe your face with the morning dew and you will be free of sin and completely cured of all ills. This seems to be a safer midnight tradition than jumping over bonfires. Don’t burn your sins – drown them. If you are on the beaches of Barcelona you will certainly not be the only one having a midnight-sin-swim. Thousands of students and young people are on the beaches of Barcelona – mostly on Bogatell and Mar Bella – for a huge beach party to celebrate the Nit de Sant Joan. Many of them swim their sins away with a dip in the sea at midnight. Fireworks are called “petards” in Catalan – and “petardos” in Spanish. There is a strong tradition of fireworks in Catalonia purportedly stemming back to the days of the arab invasions. Each barrio in Barcelona has its own firework display along with local all-night bonfires fuelled by collections of old furniture! In the barrios you will find dancing and celebrations in the plazas, street parties, music and entertainment. Firecracker – “petardos” – shops and huts spring up all over Barcelona and are usually open 10 days before the Night of Sant Joan. 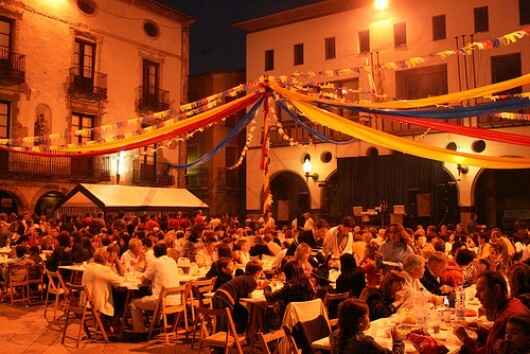 Food is an important part of any Catalan festival. For Sant Joan is a tradition to eat Catalan ‘Coca’ desserts. 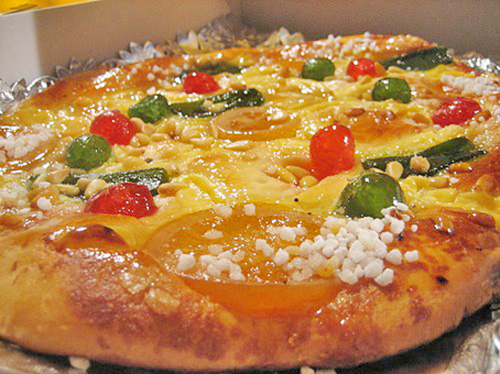 Coca consists of a bread base topped with with fillings of various kinds. The size of the bread should be twice as long as it is wide.